Toddler Books: Board Books make great gifts and are a great way to get your child interested in books from an early age. Looking for a perfect gift for a toddler? Board books are the perfect choice. They are sturdy, colorful and entertaining and a great way to start the reading process. Board Books are appropriate from about ages 1 and up. Amazon has some of the best deals on books. eBay has some great deals on lots, but usually you have to go through a bidding process and there are often shipping costs to consider. If you enjoy browsing yard sales, this too can be a great way to stock your home library. There are now thousands of board books on the market and you can apply the same principles that you would use to buy a toy. Is this a book my child would enjoy? Does it have favorite characters they know? Are the pictures appealing? 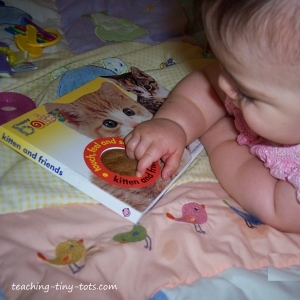 Touch and feel board books have fun textures which babies love to touch. There are even books with sounds as you turn the pages which some children love opening over and over. Is it made by a reputable company? Infants and toddlers will most likely put books in their mouths. Determine what books are "share with adult" books and keep them separate. These are the ones with the flaps, pop ups, and other fascinating features that most toddlers can't resist pulling on. Some books have s layered pages with clear or sparkle layers to create an interesting feature. Those are also "share with adult" books too because some pages will peel apart easily. Hold the book in front of your child. Point out which is the front of the book, the back of the book and which way is up. You have just introduced the first Reading Readiness Skill! Talk about the pictures or the colors. This is another very important reading readiness skill. Reading is more than just being able to read the words. Comprehension is key to a successful reader and one of the ways it is developed by learning to look at picture clues. Read the story to your child. For older toddlers you can also point to the words and read drawing their attention the the written print. Let your child spend time looking at the book on their own. 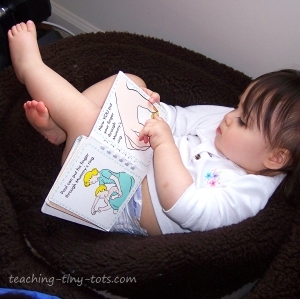 If the book is for a very young toddler, find one that is a size easy for the child to hold and turn pages. Have a location for your child to put their books whether it is a basket, shelf or toy box with book shelf. Books with very simple pictures are great for learning what objects are called, reinforcing color recognition and counting. When your child gets older they make wonderful picture dictionaries. Here are some of our Favorite Book Suggestions. Having a reading corner can be created with a book shelf or baskets of books and a bean bag chair or a few pillows. Sometimes they find their own "reading corner"!